Yes, the default game is a mess. Yes, there are some intractable issues that no patch is going to fix, like the frequent inability of CPU runners to run in a freaking straight line. Yes, animations are all-too-often not matched in speed. Yes, progression is all screwed up. With some work, though, this game is actually starting to look pretty damn good. CPU quarterbacks make inaccurate throws. The CPU tries to throw deep. Home field advantage is actually a factor. What's different this year is that sliders can have a significant impact on how the game plays, and through a fair amount of testing ("fair" in that I'm embarrassed to admit how many hours I've already put into this), the game plays quite well at times. Most of the time, actually, and it's a huge improvement over last year. So I think Bill Abner was entirely correct when he said that this is the version of the game that should have been released last year. At the default settings, the CPU doesn't run the ball effectively, the CPU doesn't pass rush well, penalties are only rarely called, and CPU kickers are too powerful and too accurate. Like I said, though, the sliders work this year, so the process of improving these gameplay issues should be straightforward, right? Here's the best example of the kind of strange relationship the sliders in this game can have. There are sliders for Run Blocking and Rush Defense. Well, if you're trying to improve the CPU running game, then just increase Block and decrease Defense, right? Yes, but the law of unintended consequences comes into play, because (bizarrely) both of these sliders also affect kickoff and punt returns. 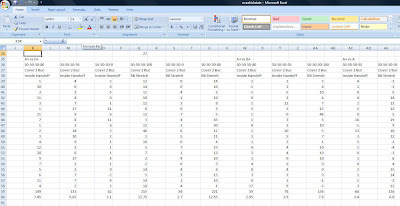 Also, some of the sliders (Run Blocking is one) have thresholds that are almost binary because of the way calculations are done--so, for instance, Run Blocking at 50 produces very reasonable results, generally, but move it up to 55 (on a scale of 0-100 in 5-point increments) and the number of defenders getting pancaked increases substantially. When a defender gets pancaked, it totally alters the flow of the play, because they're knocked down instead of just being off balance. Huge difference. That's just insane. Twenty kickoff returns and SIX touchdowns? So I set the Run Blocking slider at 0 and tried again. After that, there was no doubt that the Run Blocking slider had a massive effect on kickoff returns. I've always argued that's how sliders should work, with gigantic differences between the highest setting and the lowest. However, it's also true that those effects need to be analog as you move through the possible settings. Unfortunately, trying combinations of settings, it was clear that many combinations produced the TD binge--even seemingly nearly-balanced settings like RB at 55 and RD at 40. Like I said, when guys start getting pancaked too frequently, it blows up kickoff returns, and anything over RB at 50 seems to do that. So when you try to fix something that seems simple, you can inadvertantly blow something else up entirely. It's also very unusual that some of these sliders are almost binary at points instead of analog--very little effect at one setting, then a huge effect when you move the slider up by one notch. In this case with the CPU running game, after lots of experimentation, I discovered that the Rush Defense slider doesn't have nearly the powerful effect that Run Blocking does, and I was able to lower it to 35 (from the default 50) without affecting kickoff returns significantly, although it does improve the running game. It's time consuming (and probably unhealthy in a compulsive way), but it's interesting to see the results, both on paper and while you actually watch the game. The game looks different with different slider settings in terms of how players tackle or how fast they hit the hole, and it's not just stats that drive adjustments--it's also adjustments to improve visual fidelity as well. Of course, it's always more difficult than it should be, and that's still true this time. I've got CPU vs. CPU sliders that play like a dream. Unfortunately, all you can do with those sliders is watch a game. It will be a damn good game, but you're not playing. There's a pseudo-coach mode this year where you can turn on auto-passing, and you'd think that the CPU sliders would work great there, right? Well, no. For some perverse reason, even though your offensive lineman, for example, are still under CPU control, they won't play exactly the same with the same slider setting as the CPU lineman on the opposing team. Yes, I know--that doesn't make any sense. Welcome to EA Slider World, at least for NCAA. So stage one is to get CPU vs. CPU games working well, which is completed. Now I need to adjust the human settings so that games where I coach only work that well. After that, I can adjust those settings for when people are actively playing. I may be here a while, as they say.